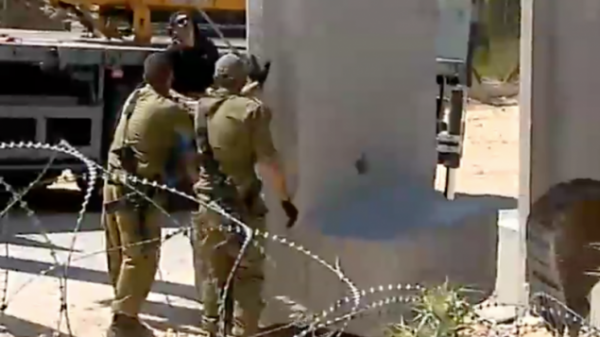 Israel’s Channel 2 news on Wednesday showed sections of a concrete wall being installed near to Kibbutz Misgav Am, a border community in the Upper Galilee. Channel 2 noted that a project to bolster the border area had been underway for some time. In 2012, a seven-meter (23-foot) high wall separating Israel from Lebanon near the border town of Metulla was completed. The 1,200-meter-long (3,937-foot) wall is outfitted with sophisticated cameras and sensory equipment aimed at preventing infiltration. The 2006 War between Hezbollah and Israel was triggered by a cross-border attack by Hezbollah and the kidnapping of Israeli soldiers . The report comes two days after the Israel Defense Forces began a surprise military exercise in northern Israel. Large numbers of aircraft, vehicles and IDF troops took part in the exercise , which was designed to test the preparedness of the Northern Command, the IDF Spokesperson said in a statement. Residents in the Golan Regional Council and in the Jordan Valley Regional Council were warned to expect increased movement of emergency forces and military vehicles throughout the week. Since the beginning of 2016, Israel has conducted a series of military drills designed to test the preparedness of the army and emergency response teams. The IDF also held a two-day general drill in and around the northern city of Safed at the weekend. Amid fast-rising tensions along the border with the Gaza Strip, meanwhile, Israel last week carried out its largest civilian drill near the Palestinian enclave since its 2014 war with Hamas, according to a report on Channel 2. Israel announced on Monday that it had found a tunnel dug under the border from Gaza by Hamas. It destroyed the tunnel a day later. Israel has been surrounding itself with thousands of kilometers of walls/ barriers/fences . Walls that separate it from the West bank , walls that separate it from Gaza, another wall that separates it from Egypt’s Sinai and the most recent wall separates it from Syria. Saudi Arabia has been building a 600 mile wall along the border with Iraq to protect it from the Islamic State. We’re back to the Middle Ages. Nah. Not gonna matter. The Resistance(tm) is unstoppable. The ghosts of Mughniyah and Samir Kuntar are coming! Zionist mothers hide your children! Those guys are dead and Israel’s GDP just went up. Their “sacrifice” was for naught. They both surrounded themselves with people who sold them out to Israel. Moths cannot beat the flame. I find your equating of moths to the likes of Kuntar and Mughniyeh a bit offensive. Moths are (mostly) harmless and rather fragile creatures. Or at least, strong fences make neighbors less likely able to kill you. If the all mighty IDF couldn’t hold back the Hizb, does the Stupid inbred Israelis think that cement wall would. Hahahahahahahaha. Very funny. The Israelis best build four walls a roof, no windows no doors, and just stay in there all alone. The world hates them and their arrogant existence. The other choice is for the Hizzbillies to try their hand at attacking Israel. Hopefully the Lebanese will do something to prevent that, considering the outcome. Instead of making friends with neighbours, they chose War and apartheid teaching their children hatred supremacy and life in a Holy Hole. I want to it make clear that half of the population as well as other Jews in diaspora, are against Zionism, those Jews are the most educated and cultivated, with real Jewish values. Israel treats Holocaust survivors as money making machine for the corrupted rich.